Want to see if sharper? Mmmmm, raspberries, my favourite. Nice image. When I first saw the image, I thought you’d put the raspberry on the hood of a car. That black plexi is a nice background. Great image David, especially the way the water echoes the round seed container parts of the raspberry. 😀 Have you tried serving them with pancakes and blueberries? With maple syrup of course, and perhaps a spoonful or two of crème fraiche? Delicious! Great shot, and it’s always interesting to read about how you set things up. Thank you Mike! It’s started to get cruddy around here (as you are well aware), so expect more of the “product” type shots in the coming months! Love that you included the Strobist info. 🙂 Also, I didn’t know you could get black plexi-glass. I’m going to have to look into that. Oh, and love the image. 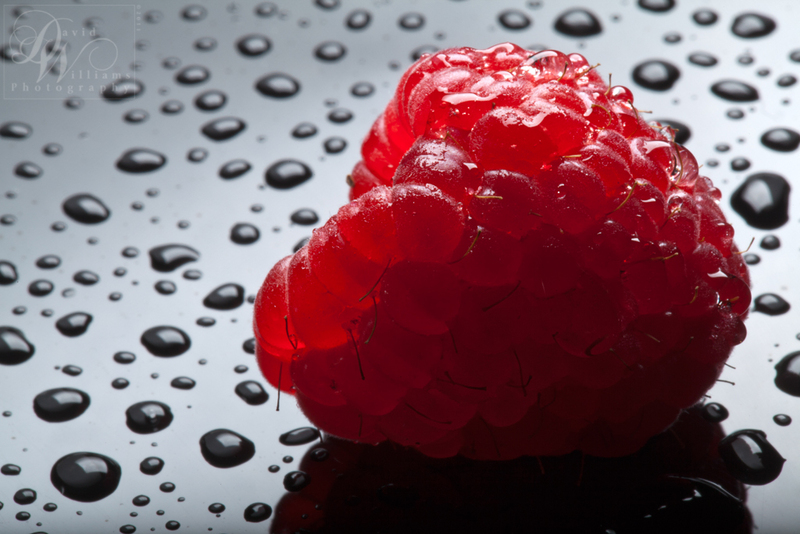 The water drops mimic the texture of the raspberry. Very good. 🙂 And yum! I have a white reflective Plexi-glass too, I just happen to like the black more! I always try to include the Strobist info on this blog…sometimes though, Mr. Forgetful comes into play just a tad too much! 😛 Glad you like it Katie. Awesome! Tell me a bit about the technique here – is the wet black background really black or did you isolate the colour in the berry and make the rest black and white (except traces of colour in the berry reflection)? It looks as if you might have merged two different photos together, though I am sure you did not. Looks very sweet. Great macro shot. Thank you Gracie, it was really yummy!